US music and movie industry companies helped to get pirate sites blocked in many countries but on their home turf, legal action is surprisingly absent. For years we have wondered why local ISPs are being left alone and we now have an answer. Former RIAA executive Neil Turkewitz says that SOPA's ghosts have been a major stumbling block. Website blocking has become one of the entertainment industries’ favorite anti-piracy tools. All over the world, major movie and music industry players have gone to court demanding that ISPs take action, often with great success. Internal MPAA research showed that website blockades help to deter piracy and former boss Chris Dodd said that they are one of the most effective anti-tools available. While not everyone is in agreement on this, the numbers are used to lobby politicians and convince courts. Interestingly, however, nothing is happening in the United States, which is where most pirate site visitors come from. This is baffling to many people. Why would US-based companies go out of their way to demand ISP blocking in the most exotic locations, but fail to do the same at home? We posed this question to Neil Turkewitz, RIAA’s former Executive Vice President International, who currently runs his own consulting group. The main reason why pirate site blocking requests have not yet been made in the United States is down to SOPA. When the proposed SOPA legislation made headlines five years ago there was a massive backlash against website blocking, which isn’t something copyright groups want to reignite. “The legacy of SOPA is that copyright industries want to avoid resurrecting the ghosts of SOPA past, and principally focus on ways to creatively encourage cooperation with platforms, and to use existing remedies,” Turkewitz tells us. Instead of taking the likes of Comcast and Verizon to court, the entertainment industries focused on voluntary agreements, such as the now-defunct Copyright Alerts System. However, that doesn’t mean that website blocking and domain seizures are not an option. 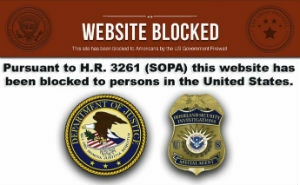 “SOPA made ‘website blocking’ as such a four-letter word. But this is actually fairly misleading,” Turkewitz says. Indeed, there are plenty of legal options already available to do much of what SOPA promised. ABS-CBN has taken over dozens of pirate site domain names through the US court system. Most recently even through an ex-parte order, meaning that the site owners had no option to defend themselves before they lost their domains. ISP and search engine blocking is also around the corner. As we reported earlier this week, a Virginia magistrate judge recently recommended an injunction which would require search engines and Internet providers to prevent users from accessing Sci-Hub. Still, the major movie and music companies are not yet using these tools to take on The Pirate Bay or other major pirate sites. If it’s so easy, then why not? Apparently, SOPA may still be in the back of their minds. Interestingly, the RIAA’s former top executive wasn’t a fan of SOPA when it was first announced, as it wouldn’t do much to extend the legal remedies that were already available. “I actually didn’t like SOPA very much since it mostly reflected existing law and maintained a paradigm that didn’t involve ISP’s in creative interdiction, and simply preserved passivity. To see it characterized as ‘copyright gone wild’ was certainly jarring and incongruous,” Turkewitz says. Ironically, it looks like a bill that failed to pass, and didn’t impress some copyright holders to begin with, is still holding them back after five years. They’re certainly not using all the legal options available to avoid SOPA comparison. The question is, for how long?